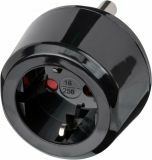 Travel Adapter, Brennenstuhl, transient from Swiss to Schuko, black, 1508480 Аdapter Brennenstuhl, CEE 230VAC / 16A 3Pin from Swiss (type J) sockets to EU Schuko sockets with degree of protection IP44. Travel Adapter, Brennenstuhl, from Schuko to Australia/China, black, 1508440 Аdapter Brennenstuhl, CEE 230VAC / 16A 3Pin to Schuko socket with degree of protection IP44. Travel Adapter, Brennenstuhl, Schuko to USA, Japan, black, 1508450 Universal travel adapter, Brennenstuhl, Schuko socket to USA, Japan plug with 2 pins. Child proof. Travel Adapter, Brennenstuhl, Schuko to Swiss, black, 1508642 Universal travel adapter, Brennenstuhl, Schuko socket to USA, Japan plug with 2 pins. Child proof. 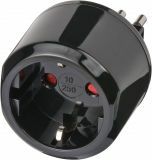 Travel Adapter, Brennenstuhl, Italy to Schuko, black, 1508590 Travel adapter Brennenstuhl from Italian standard to Schuko plug (Italy=>Earthed). This adapter enabling you to use your electrical equipment with Italian plug system in countries with earthed socket systems, e.g. DE, FR, BE, CZ, PL, NL, ES, PL,SE, FI, NO, GR, TR, AT. Childproof sockets. Travel adapter, Brennenstuhl, Schuko to Italy, black, 1508470 Brennenstuhl travel adapter suitable for transion Earthed/ Italy with childproof socket. This adapter enables electrical equipment using earthed systems, e.g. DE, NL, ES, PT, SE, FI, NO, GR, TR, AT and others to be used in countries using Italian systems (Earthed, Schuko=>Italy). Max. load is 10A/250 V.
Travel Adapter, Brennenstuhl, Adapter to 7 Standards, 1508160 7 versions world travel adapter set from Brennenstuhl for a wide application in more than 150 countries. Safe, universal adapter enabling electrical equipment with a European plug system to be plugged into other types of power point abroad. Travel plugs with 10A fuse. Fabric assortment bag is included in package. 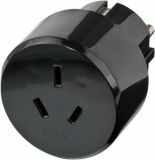 Travel Adapter, Brennenstuhl, transient from Schuko to USA, black, 1508550 Universal travel adapter from german brand Brennenstuhl from Schuko Earthed to USA 3-pin plug. This model adapter enabling electrical equipment using an earthed plug system in countries like USA(Earthed => USA). Child protection. Travel Adapter, Brennenstuhl, USA, Japan to Schuko, black, 1508520 Practical travel adapter from german brand Brennenstuhl from USA, Japan to Earthed. This model adapter enabling electrical equipment using the USA and Japanese earthed plug system to be used in countries using an earthed socket system, e.g. DE, FR, BE, PL, NL, ES, PT, SE, FI, NO, GR, TR, AT. (USA, Japan => earthed). Child protection is not availbale. 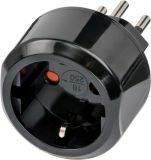 Travel Adapter, Brennenstuhl, UK/GB to Schuko, black, 1508530 Universal travel adapter from german brand Brennenstuhl which enables electrical equipment using British plug system to be used in countries with earthed schuko socket system. (GB=>Earthed). Childproof socket. Travel Adapter, Brennenstuhl, Schuko to UK/GB, black, 1508533 Universal travel adapter Brennenstuhl from earthed Schuko standard to UK/GB plug with 3 pins (Earthed=>UK/GB). This adapter enabling you to use your electrical equipment with schuko plug system in countries with GB socket systems, e.g. UK, HK, UAE. Child prtection. 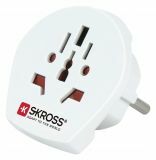 Travel adapter World to Europe/schuko, 16A, universal, white, Scross, SKR1500211 Handy and compact universal travel adapter form Scross (World to Europe plug) designed in Switzerland suitable for transition from USA, AU, UK/GB standards to BG and EU (schuko, earthed). Max. load 16A. This adapter does not convert voltage! Compliant with all international safety standarts. Travel Adapter, Brennenstuhl, from Schuko to South Africa, India, black, 1508460 Travel Adapter, Brennenstuhl, from Schuko socket to type D plug in South Africa, India and others. Child proof. Travel adapter, contact to USA 2 pin to Schuko, white Small and handy travel adapter from USA to European earthed plug (Schuko) with which you can easily use electrical devices and appliances with contact systems from USA, Canada, Mexico, Japan in countries with earthed Schuko system such as Bulgaria. (USA=> Earthed). Universal travel adapter 1000W, 16A, 250VAC Universal travel adapter plug suitable from American, Australian, English (USA/ AU/ GB/ UK) standard to Bulgarian and European (Earted/ Schuko). 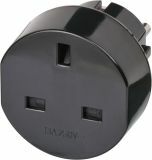 If you have purchased an electronic appliance from USA or UK and want to plug it into Bulgaria you can use this adapter. 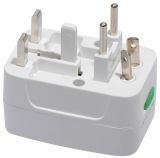 Universal Travel Adapter, YJ-002, adapter to AU/UK/US/EU standards, white Universal travel adapter for easy connection to the electrical grid of 2 or 3-pole devices in Europe, USA, UK, Australia, Africa and Asia. It is not suitable for Italy.